If you often eat even though you're already full, and find that eating becomes the primary coping mechanism that you use to manage emotions, then you are experiencing "emotional eating". You eat because these foods make you feel better; feed the emotional needs rather than filling your stomach. This in turn makes you feel miserable and guilty because of the unnecessary calories you have consumed. Learning to recognize emotional eating triggers is the first step towards breaking free from these food cravings, and changing your habits that have disrupted your diet in the past. Before breaking from the emotional eating cycle, you need to learn to differentiate between physical and emotional hunger. Emotional hunger is often mistaken for physical hunger, but here are a few clues you can look for which can further help you distinguish the two. - Emotional hunger is instant and comes on suddenly. Whereas, physical hunger comes on gradually. - Emotional hunger makes you crave for specific comfort foods. On the other hand, physical hunger can wait and open to options. - Emotional hunger leads to mindless eating and keeps you unsatisfied even if you are full. Physical hunger generally ceases when you're full. - Emotional hunger leads to guilt and regret because deep down you know you are not eating for nutritional reasons, whereas physical hunger doesn't make you feel guilty after you have eaten. What are the common causes of emotional eating? 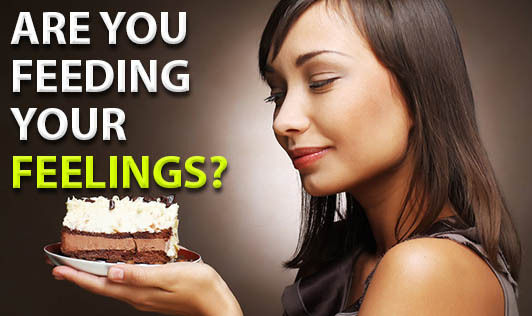 -Rewarding yourself for having achieved a goal - This is an example of a positive feeling triggering emotional eating. How do you fight emotional eating? The first thing one needs to do in order to overcome emotional eating is to recognize it, by identifying personal triggers, such as situations, places, or certain feelings that you make you reach out for the comfort food? - Identify and learn to accept you're feelings-even the bad ones. - When you find the urge to eat when you're not hungry, replace the junk food with a healthy one. - Take a breather for 5 minutes every time the craving hits you and just tell yourself to wait. While you're doing so, try to understand your emotion. You may even end up eating, but then you will have a clear understanding of why you gave in to that craving. - Find alternatives to emotional eating such as calling someone who always makes you feel better when you're depressed, taking a brisk walk or even dancing to your favourite song when you're anxious, reading a book or even exploring outdoors and doing activities that you enjoy when you're bored. - Writing down the emotions that usually trigger your eating. This can help you track the moods and the feelings that make you crave for certain kinds of food. Thereby, use this information to make better choices. - Make healthy lifestyle changes such as making daily exercise a priority, 8 hours of sleep every night; make time for relaxation and connecting with people. Don't resort to mindless eating; this could only complicate your life more leading to many health problems. Instead, do something that would calm you down. Find things other than food to relax you. By distracting yourself, the urge to eat will eventually subside. So, go on and begin to learn to deal with your emotions in healthier ways other than food!! !